Diabetes is a condition in which blood glucose (sugar) is too high. The body uses glucose from food as a source of energy, much like a car uses gasoline for fuel. Insulin, a hormone that is made in the pancreas, moves glucose from the bloodstream into cells to be used for energy. When you have diabetes, your body either doesn’t make enough insulin (or stops making insulin altogether), or doesn’t use its own insulin as well as it should. As a result, glucose builds up in the blood and can’t get into cells to be used for energy. There are many types of diabetes. Two of the main types of diabetes are Type 1 diabetes and Type 2 diabetes. Type 1 diabetes occurs when the immune system attacks and destroys the cells in the pancreas (called beta cells) that make insulin. The exact cause of Type 1 diabetes isn’t known, but scientists think that genes or environmental factors (such as viruses) could be responsible. Type 2 diabetes is also caused by genes, as well as lifestyle factors, such as being overweight and not getting enough physical activity. The good news is that Type 2 diabetes can be prevented by losing between 5 and 10 percent of your body weight and aiming to get at least 15 minutes of moderate physical activity each week. About 30 million (9.4 percent) Americans have diabetes. 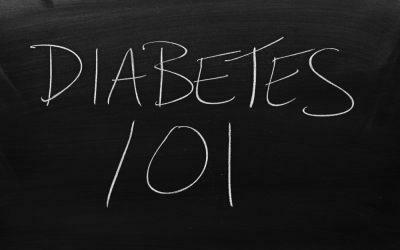 Anyone at any age can get either Type 1 or Type 2 diabetes. Type 1 diabetes accounts for about 5 percent of cases of diabetes. However, Type 1 diabetes usually appears during childhood or adolescents. But again, adults get Type 1 diabetes, too. Risk factors for Type 1 diabetes include genes from both parents and environmental factors such as cold weather and viruses. Scientists think that people who are breastfed as infants and introduced to solid foods at a later age are less likely to get Type 1 diabetes.